The temple complex at Angkor has over two million visitors a year, with half of the tourists who come to the country visiting. 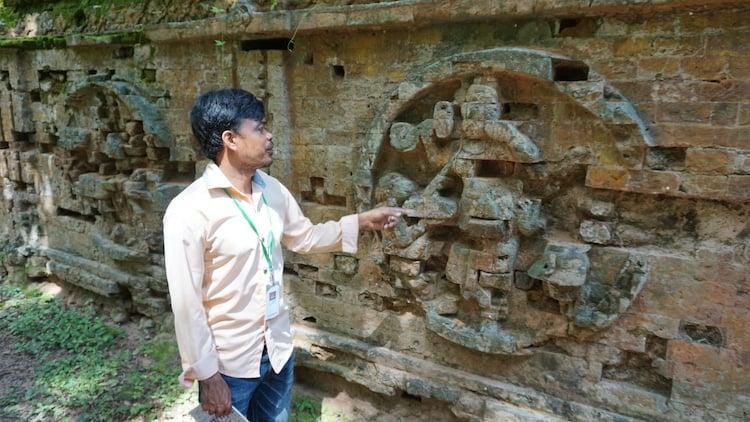 But a couple of hours away there is a less famous location that has recently been given UNESCO World Heritage Site status, after it was confirmed as Isanpura the capital city of the Chenla Kingdom. This is Sambor Prei Kuk. 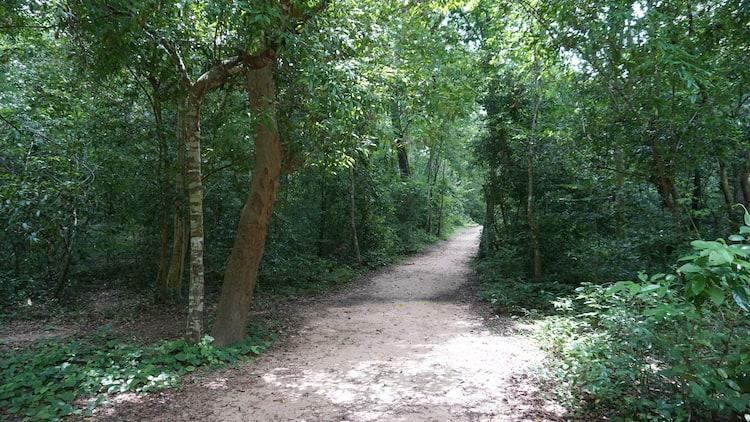 According to our guide, Sambor (many) Prei (forest) Kuk (temples) means, ‘many temples inside the forest’. 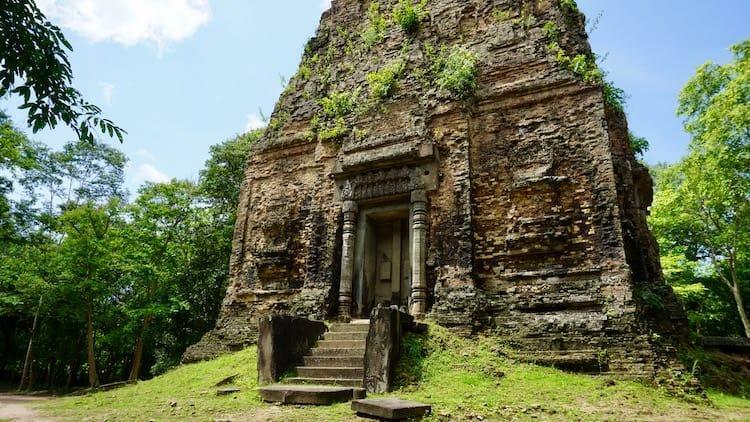 It may be smaller in size than Angkor, but with restoration works taking place thanks to an influx of UNESCO money and still being largely untouched by tourists (around 100 a day in the high season), this might be the Indiana Jones style adventure you’ve been looking for. Oh, and just to set the record straight, it’s definitely not a little brother to Angkor, as it’s at least 100 years older than the most ancient buildings at the more famous site. So, if I’ve whet your appetite just a little, here’s everything you need to know about visiting. 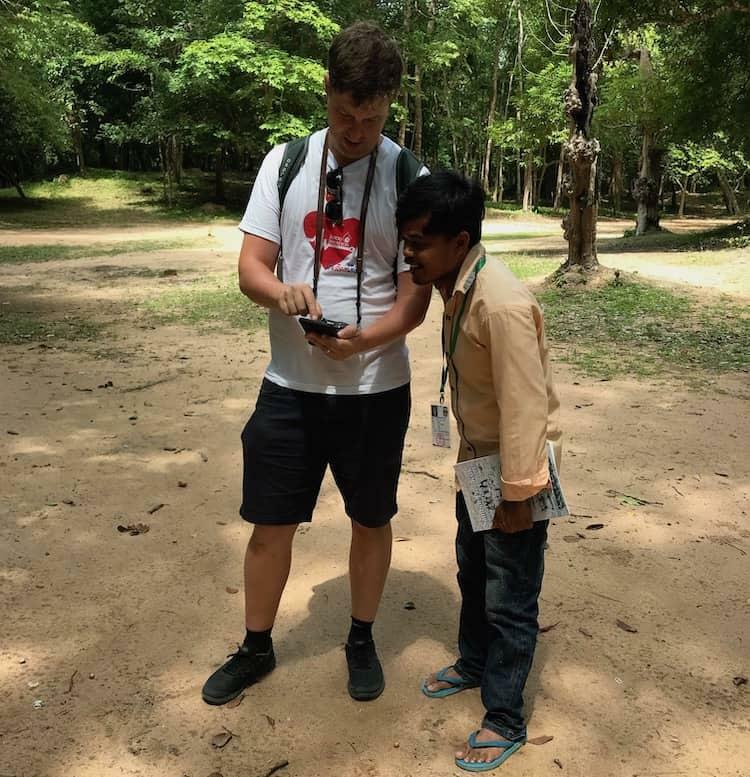 Getting to Sambor Prei Kuk proved to be more difficult than expected! It’s still not really on the tourist trail, so, despite being in a town full of tour offices, we struggled to find any that were going! I turned to one of my favourite travel tips, and put a posting on a local Facebook group asking if there were any companies or drivers available. There were lots of responses, but we eventually decided on Travelhacks Tours who have an office close to the centre of Siem Reap. We had to pay cash in advance, but the office was easy to find, and Liza who runs it was brilliant. There was also cool water and some snacks in the car! 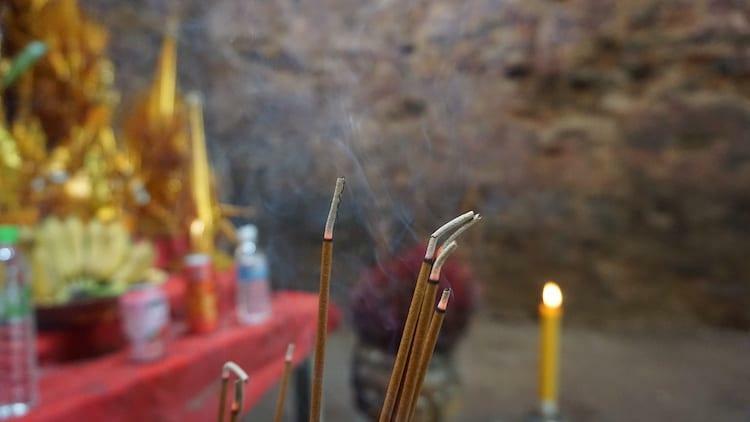 When you arrive at Sambor Prei Kuk there is a little hut where you pay your entrance fee to and arrange a guide. From June 2018 this price has gone up from $3 to $10 for foreign visitors, in light of the UNESCO status. This still feels very reasonable to me given the history of the site. I would also thoroughly recommend getting a local guide for $6. We had a lovely guy called Noun Votea who has lived in the area all his life (you can see us doing our little and large impression above!). There are also lots of young kids around selling scarves. 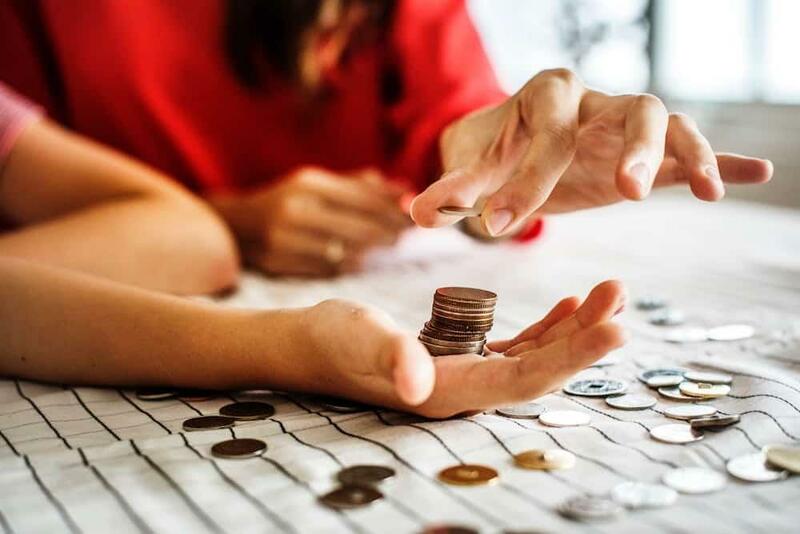 Often you’re told not to buy these as the kids should be in school, but as Nuon explained, they only have the money to go to school for half a day in this part of the country. We bought a couple of scarves for $1 each. 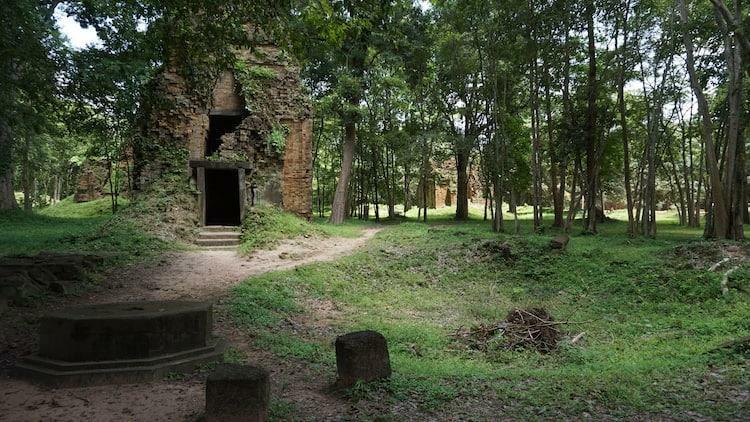 Sambor Prei Kuk still has very low visitor numbers. Nuon told us that even in the high season they get a maximum of 100. We were there at 9am on a Saturday morning and were the first to arrive. The previous day they had only had eight people visit! This place really has a sense of being completely undiscovered still. Chenla was a direct ancestor of the Khmer Empire. It first appears in Chinese Chronicles as a subordinate state of the Funan Kingdom, gaining independence around the year 550 A.D. In the next 60 years, Chenla succeeded to conquer its predecessor the Funan, and gradually absorbed its people as well as inheriting the culture. Sambor Prei Kuk, also known as Isanapura was the first capital of Chenla established around 613 A.D. Most buildings were built under the reign of King Isanavarman I. The complex forms three groups: the North Group (Prasat Sambor), the Central Group (Prasat Tao) and the South Group (Prasat Yeay Poan). Buildings and walls are mainly in brick, a characteristic of pre-Angkorian structures. Later on Chenla was divided into north and south states, of which the Chinese Chronicles refer to as ‘Land Chenla’ and ‘Water Chenla’, respectively. 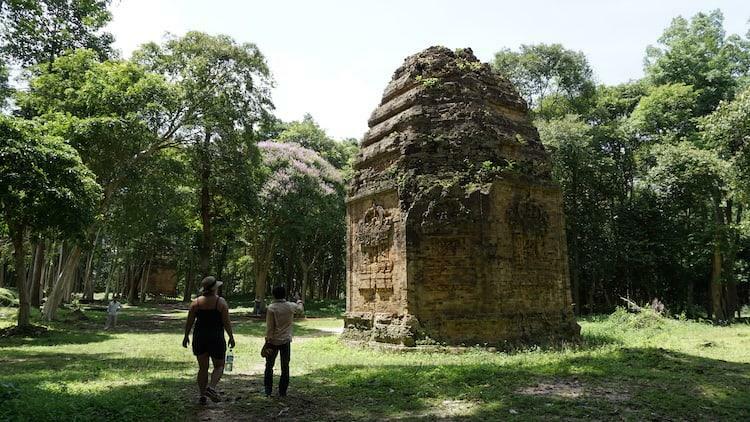 The centre of the northern Chenla was at the Champassak province in today’s southern Laos, where you can find the impressive temples at Wat Phu. Southern Chenla occupied the former Funan’s territory along the Mekong Delta and the coast. In 715, both Chenla states were further broken up into several smaller states. In 790 a young Cambodian prince, claiming to be descended from the rulers of Funan, was consecrated in eastern Cambodia under the title Jayavarman II. 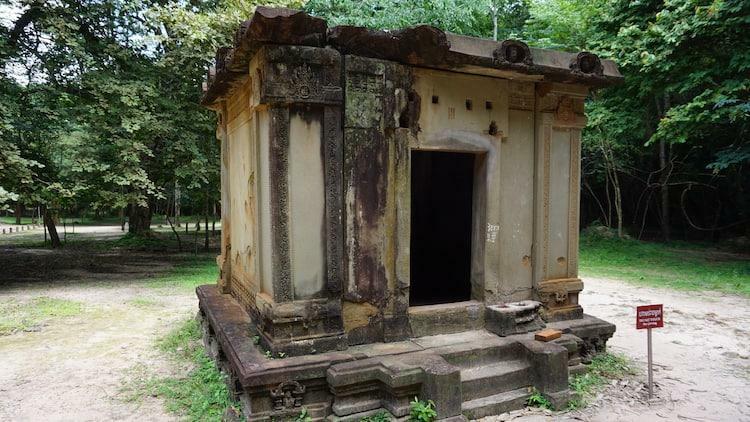 In 802 A.D. the Khmer empire was founded, which saw a switch of power from Chenla to Isanapura (near Siem Reap), which would be the centre of power in the area for the next 600 years. 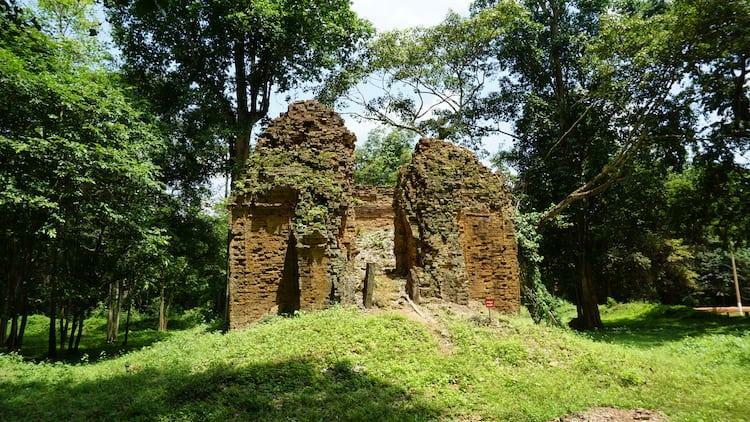 Sambor Prei Kuk was added to the United Nations Educational, Scientific and Cultural Organization (UNESCO)’s World Heritage List on 8th July 2017. 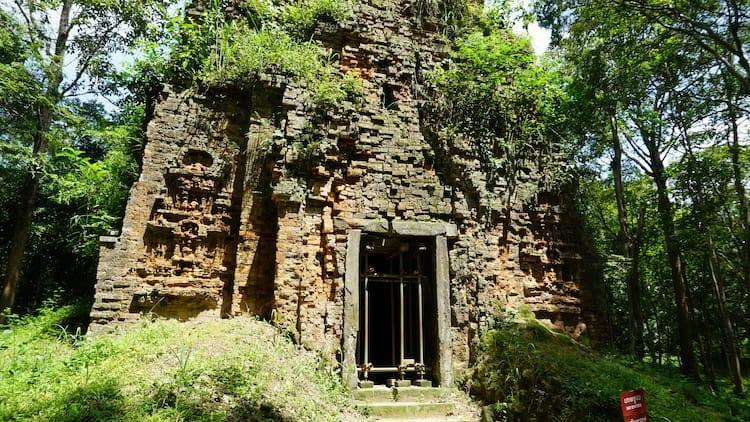 UNESCO list sites that should be preserved for the future of mankind, and Sambor Prei Kuk was added because of its importance in the history of Cambodia, and also the unique nature of the eight octagonal temples on the site. It’s not all good news. There have been mixed feelings from local people about the UNESCO status. 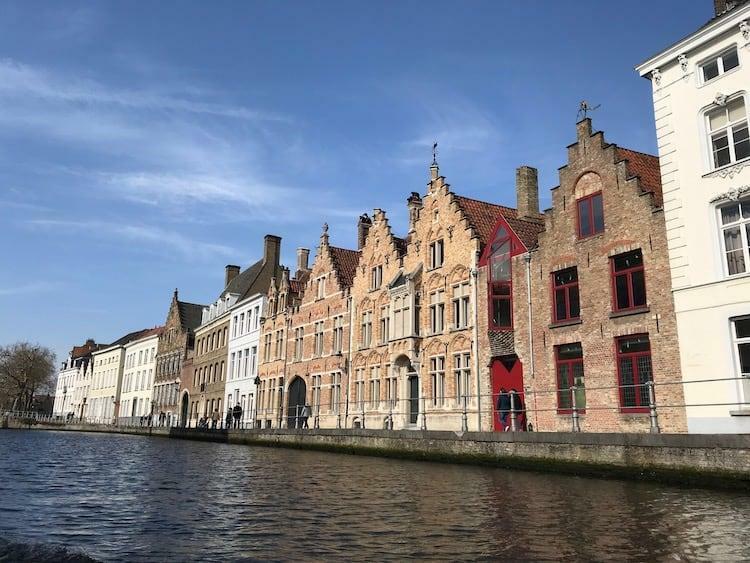 Whilst it will undoubtedly bring more tourism, and therefore increased earnings to the area, it also means a controlled zone where there are restrictions on housebuilding and farming. It is still too early to tell if one will make up for the other. 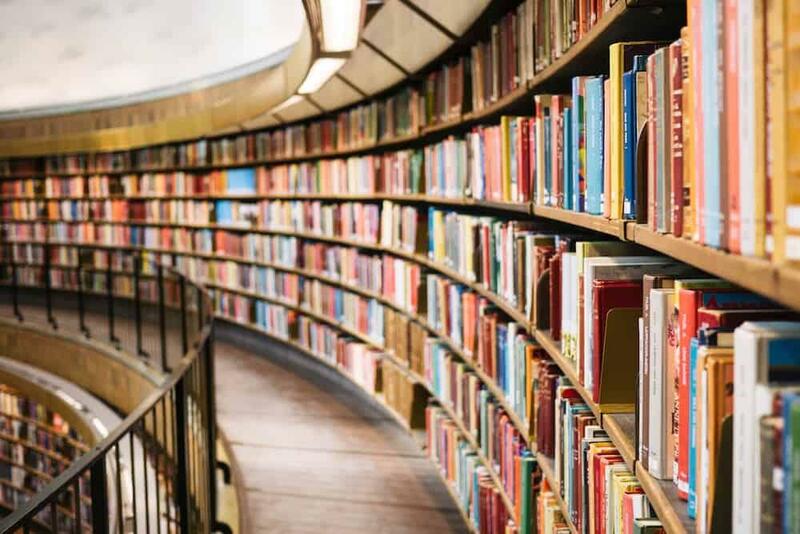 To read more about the UNESCO status, you can find information and community views at WorldHeritageSite.org and the official listing on the World Heritage Site website. We weren’t really sure what to expect when we got here, as there wasn’t a lot of information on the internet. After arriving at the complex, and picking Nuon (our guide) up from the gate, the driver dropped us off at the south part of the site. Sambor Prei Kuk is split into three, so the plan was to start at the south, and then walk through the central part before finishing in the north where the driver would be waiting to pick us up. The first temple we walked to was the one above. It is one of the octagonal buildings that make this site so famous. According to Noun they were dedicated to the protector god Vishnu, who is often depicted with eight arms. 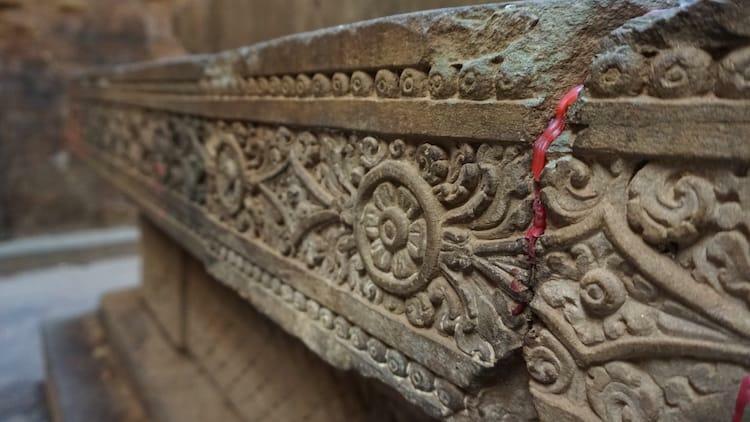 Despite being nearly 1,400 years old, the carvings on the side of the temple were still intact, though the building itself was falling apart, with one side almost completely worn away. You can see at the top where it has been secured with wire and wood to try and stop the sides pulling away from one another. On the inside you can see why I described it as like being from an Indiana Jones movie (and it’s not just Becca’s hat!). It is like a big chimney, with incense burning away and wax from long burned out candles dripping down the sides on the intricately carved lingam. We headed out through a two meter high wall, which was decorated with various sections to the central group of temples. In the middle of the central complex is the ‘Lion Temple’, which has a lion carving either side of the doorway. This temple has been dug out of the mound of earth surrounding it, and it’s amazing it’s survived so well. 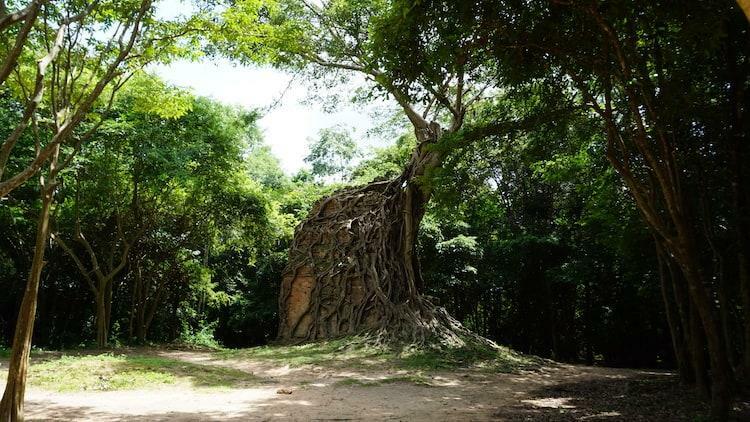 It’s the biggest at Sambor Prei Kuk, standing 35m tall. Inside the temple incense was burning, creating a hazy atmosphere that caught perfectly in the sun’s rays coming down through the narrow opening at the top. 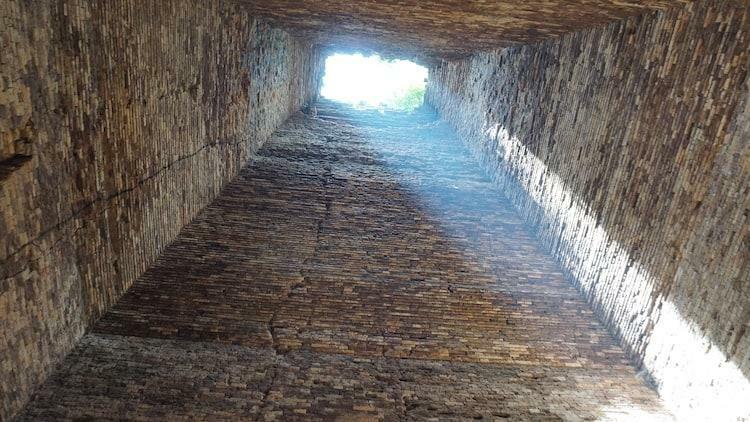 You can clearly see the brickwork here, and also the large cracks which present such a huge restoration challenge at the site. We walked out of the central group, past a large (now drained) ceremonial pond. 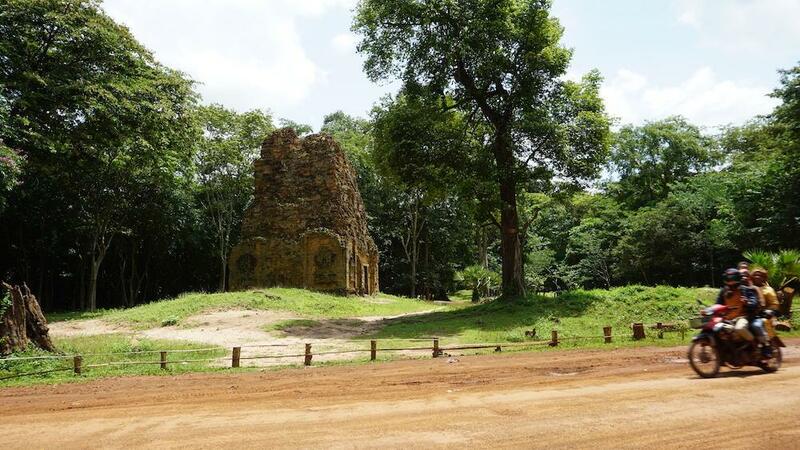 You can see from the photo above how lost in the forest Sambor Prei Kuk really is. 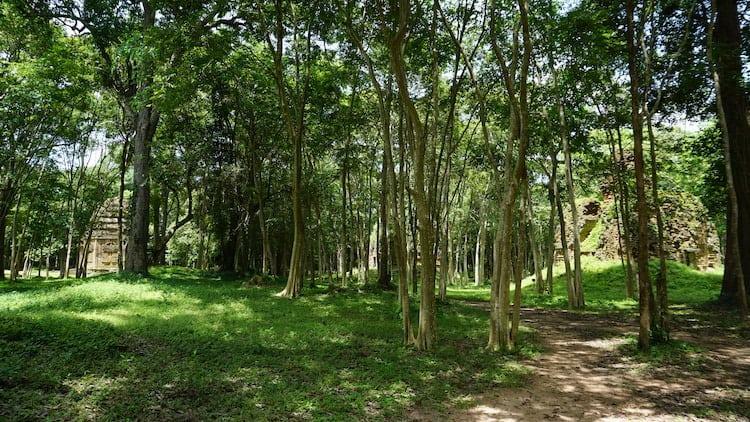 One minute you’re surrounded by temples, and the next they’re lost to the trees. Then they appear again, first just a flash of sunlight on some brickwork in the distance, and then the trees part to reveal the temples fully. In this part of the complex you can really see how needed the UNESCO money is. 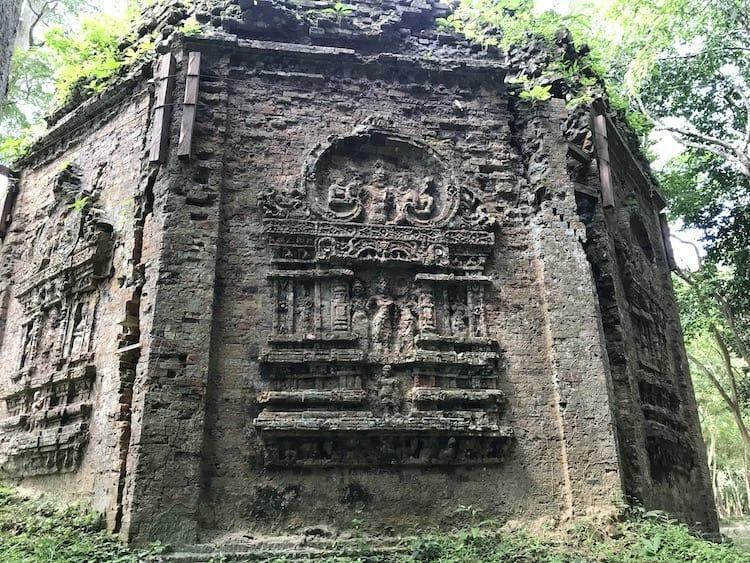 There are many temples shut off as they are too dangerous to enter, with cracks in the brickwork and the forest making a concerted effort to reclaim the space for itself. 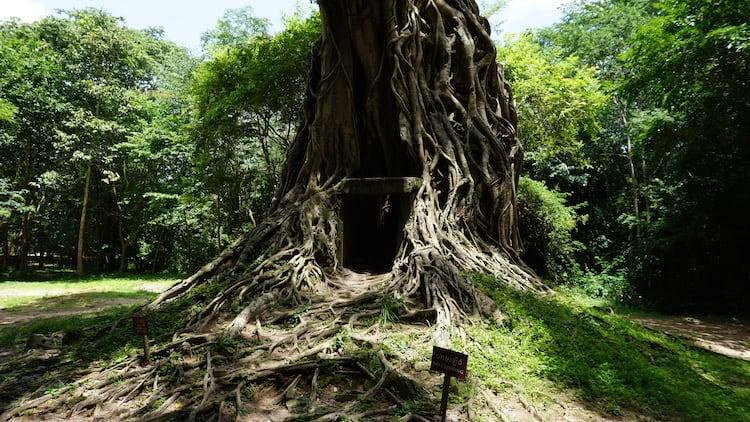 It’s here we found one of Sambor Prei Kuk’s most famous sights, the temple swallowed by a tree. It has a more famous equivalent, Ta Prohm at Angkor, which featured in the Tomb Raider movies. I personally think this one is much more impressive though, as the tree has devoured the entire building, like some giant land-based squid coming swallowed its prey whole. We finished the tour at the oldest temple here, which was much smaller, and had a simpler design than the rest. Despite its age there were some incredible carvings on the pillars that have miraculously survived many centuries of weathering. 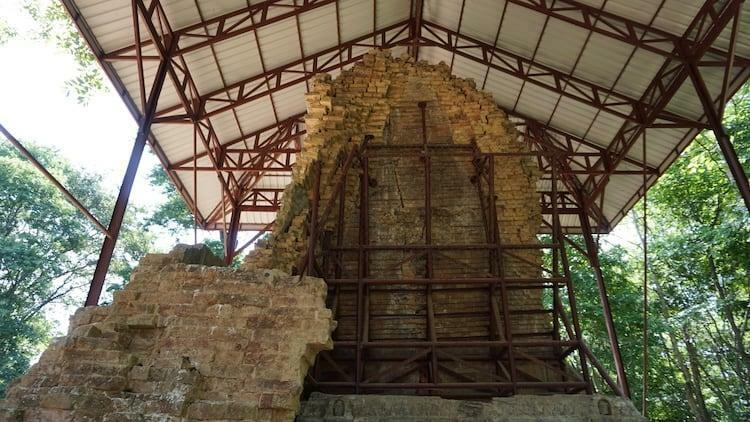 Thanks to UNESCO funding there is lots of restoration going on at the site. 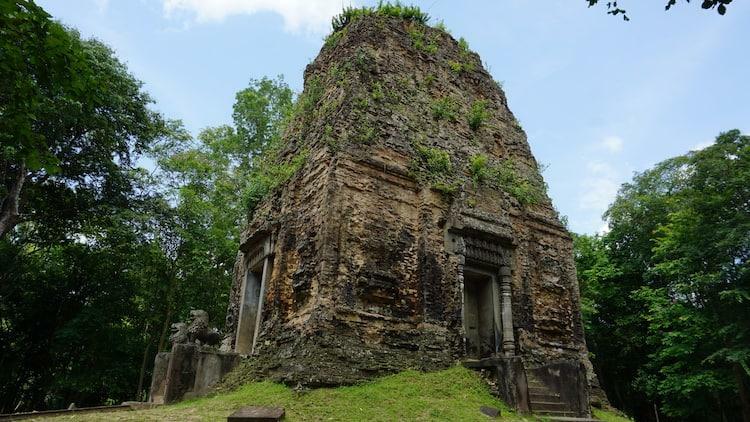 These temples were largely abandoned for over 1,000 years, so have been lost to the jungle in many places. They were also caught up in the Khmer Rouge conflict and the secret war that took place in Laos and Cambodia during the Vietnam War. 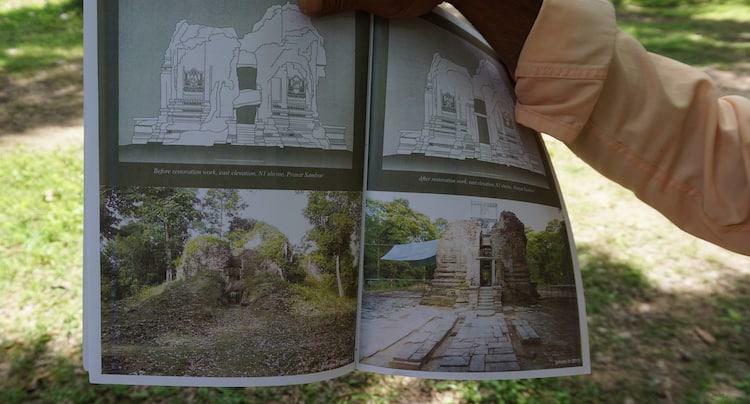 The photo below was in the documents used by our guide, and shows how a temple has been restored by digging it out of a mound of earth, a huge job! 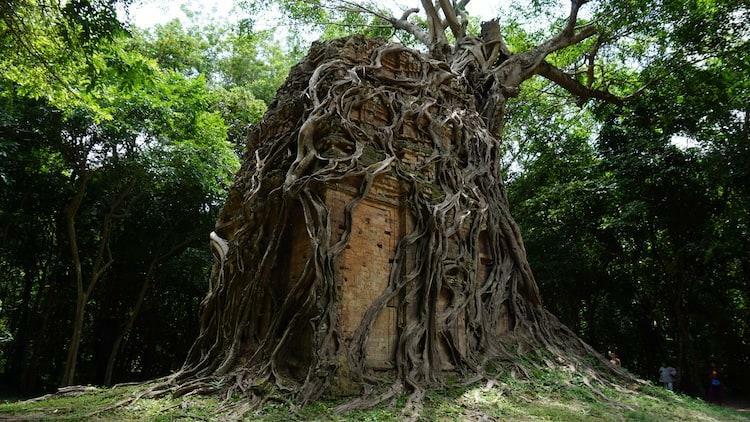 There are temples almost completely taken over by trees, and some in rubble thanks to American bombs that fell nearby. There is evidence of damage to the buildings by bombs, and crater dotted across the site caused by both bombs and landmines. We were at the site on a weekend, and restoration work was in full swing. I asked our guide where the workers come from, and he said they are farmers who supplement their income by helping with the restoration at the weekend. Apparently they get $6 a day, it really is a different world! 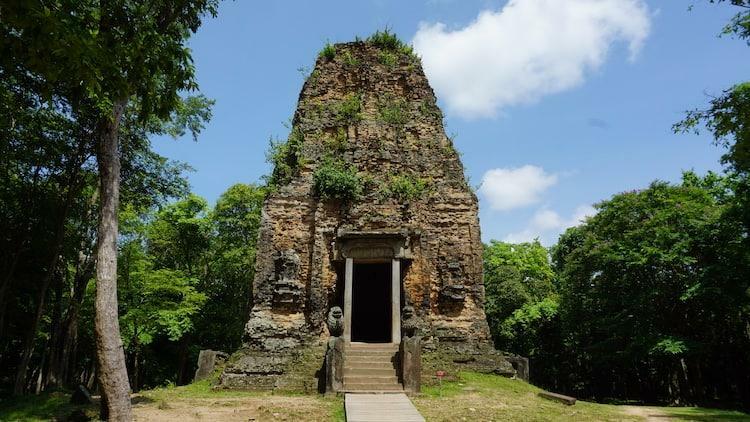 It’s almost certainly true that Sambor Prei Kuk can never compete with the ancient wonder of Angkor, but it can make a lasting impression and help grow the local economy. For us it was well worth the visit. 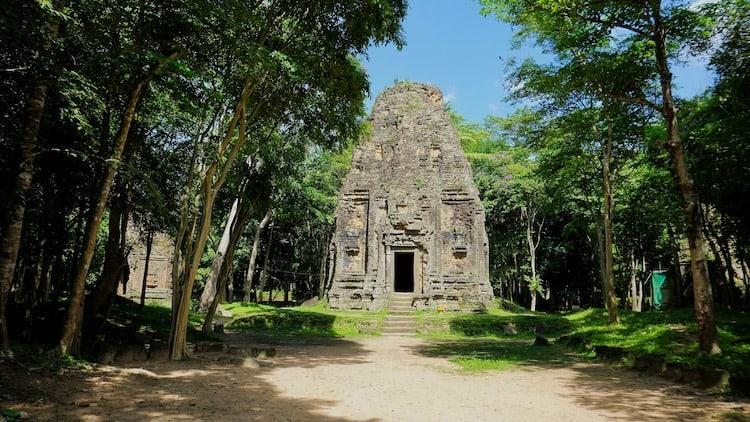 Clearly Angkor will be your first choice, but if you have an extra day then try and get out to Sambor Prei Kuk. Anywhere else in the world and it would see people travelling hundreds of miles to come here, it’s only due to its location that it gets overlooked. 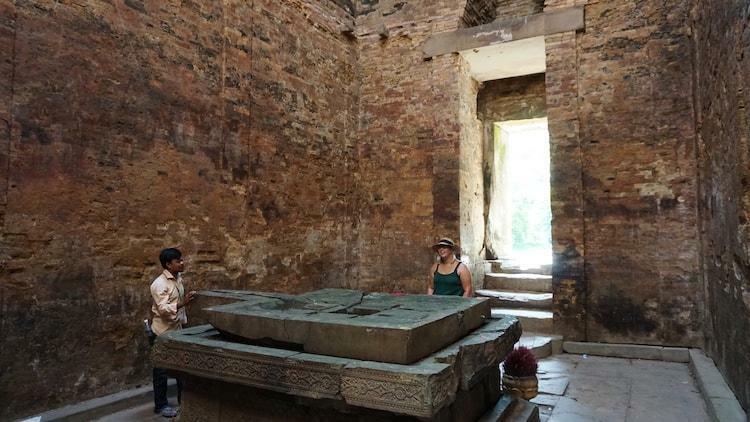 It can’t deliver the scale of Angkor, but what it can do is present a rugged, authentic experience that will leave you feeling like a pioneering explorer discovering an ancient settlement for the first time. It fills in the gaps of a pre-Angkor world, and allows you to marvel at what our ancestors could achieve in a non-mechanised world.